If you are planning to be one of the estimated three million people taking part in this year’s WorldPride Madrid 2017, you probably have a plan for making the most of your time in the Spanish Capital. Parades, parties, clubs, restaurants, tapas bars, parks and museums… Madrid has it all no matter your travel style or budget. But one of the best things to do in Madrid during Pride is try authentic local Spanish food. Madrid is one of Spain’s most exciting cities for cuisine, and is chock full with incredible markets, tapas bars, wine bars and restaurants. Our friends from Devour Madrid Food Tours offer great tours and they know all the city’s foodie secrets. To make sure you get a true taste of the city, a food or tapas tour in Madrid is definitely the way to go. Here’s why! With literally thousands of tapas bars and restaurants to choose from, the eating options in Madrid can be daunting! If you’re only in town for a few days, don’t waste a precious meal on a lackluster tapas bar. 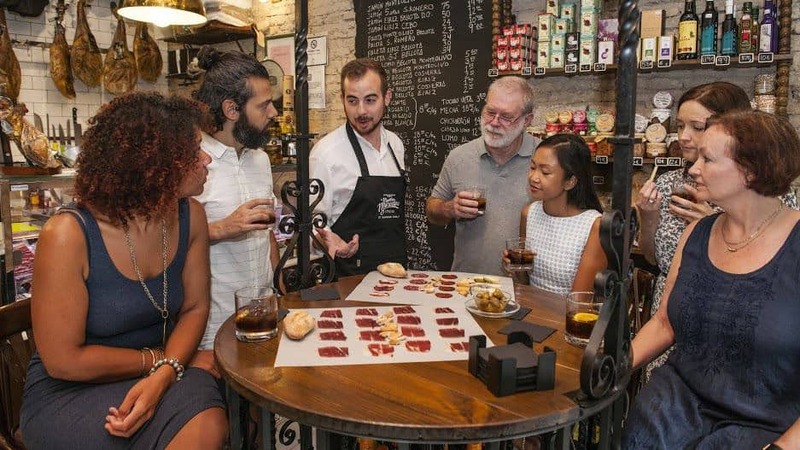 Food tours show you not only the hidden gems of Madrid’s tapas scene throughout the tour, but teach you locals’ tricks to be able to pick a great tapas bar from a tourist trap. 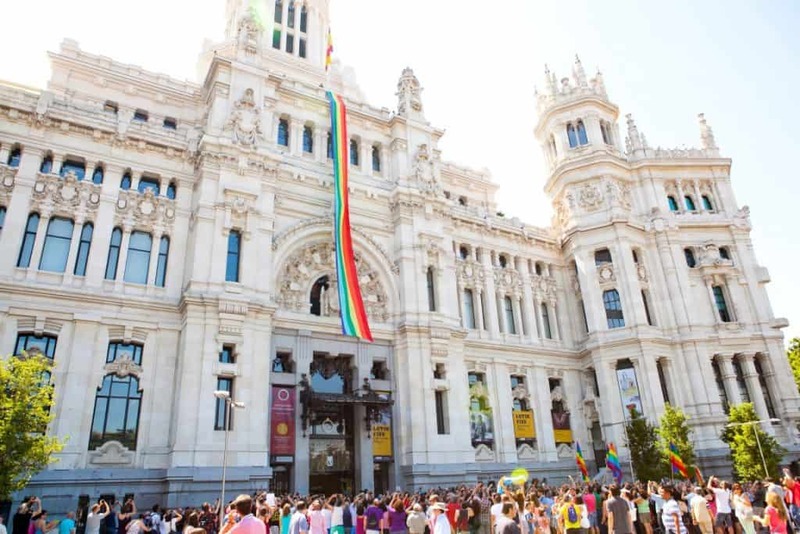 More than three million people are expected to flood Madrid for WorldPride this year and most of them are undoubtedly headed straight (or gay-ly forward) for Chueca, Madrid’s famous gayborhood. Take a break from the madness to explore one of the city’s many other gorgeous neighborhoods on one of Madrid’s fascinating and delicious food, wine and tapas tours. Stroll the peaceful cobblestones of the Literary Quarter and discover where many of Spain’s most famous artists, actors and authors lived and worked. Or peek into centuries past in the historic city center as you taste tapas from century-old taverns. Vermouth, tinto de verano, cañas and kalimotxos (yes it’s red wine & Coke but so delicious! )… Madrid’s beverage scene is not for the faint of heart. Let a local take care of the ordering so you can focus on the sipping! In Madrid, there is a beverage for just about every hour of the day. On an evening tapas tour you’ll get to tastes these drinks like a local at the bars and restaurants where they are done best! Tapas in Madrid are so much more than small plates, they are a social institution. But to get the best bites you have to know where to go and what to order. Many of the tapas bars in Madrid specialize in just one or two plates. 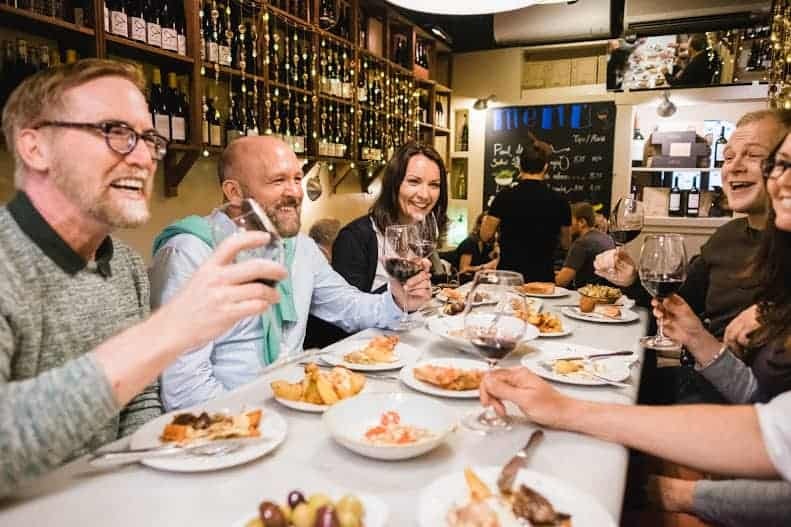 A tapas tour will give you can the low-down on what to look for and how to order like a local so you’ll be able to eat ridiculously well the rest of your trip! 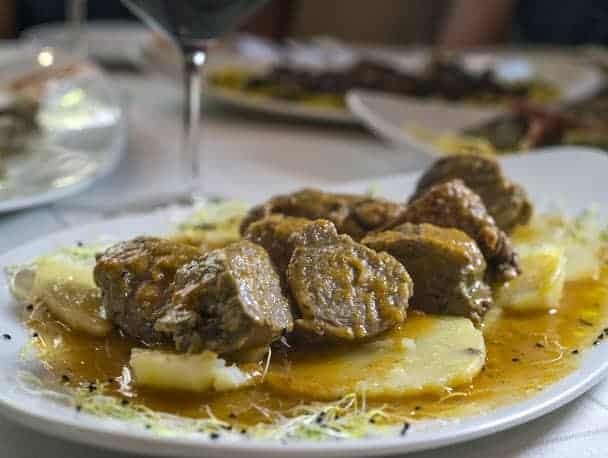 Madrid is the melting pot of Spain when it comes to regional cuisines which means there are more delicious dishes to devour than you could possibly eat in one week. The beauty of a food tour is that you can try what Spaniards call un poco de todo— a little bit of everything. The oldest continually operating restaurant in the world (Guinness World Record confirmed) was established in Madrid in 1725. 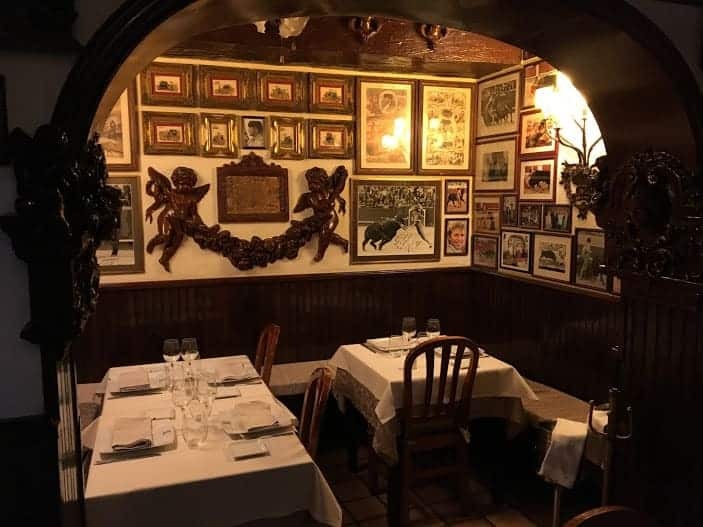 This tidbit verifies that Madrid is teeming with history and, lacking a time machine, authentically old restaurants are the best place to get a feel for this time in history. Truth be told, a trip to these historic restaurants is a missed opportunity without a local guide. Food tour guides know not only where to go, but are equipped with an intimate knowledge of each place they visit. They’ve also developed relationships with the establishments’ owners and often long-employed staff, which opens the door for you to find out more about Madrid’s fascinating past from those most privy to it. Spain is overflowing with such a large assortment of quality wine that it can be a bit overwhelming (or, you know…challenge accepted!). 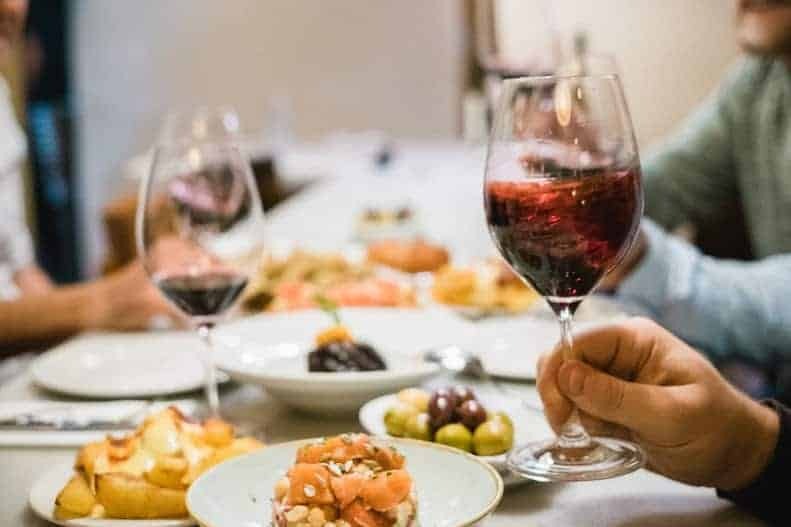 A food tour, particularly one geared towards wine, will give you the low-down on the different regional wines (seriously, there isn’t a grape that doesn’t grow somewhere in Spain). You’ll taste robust Rioja, aromatic Albariño, rich Rueda and countless others, and also discover the best foods to accompany them. By the end of the tour (although a bit tipsy), you’ll be able to guide all of your new friends when you’re out at the bars. In Madrid life, food and culture are inexorably intertwined. With some of the world’s greatest and most extensive art collections housed in a myriad of museums—ranging from the grand Prado to the small Sorolla—Madrid is a veritable playground for art-aficionados. Although some introspective downtime can do you good, nobody wants to celebrate Pride holed up for hours in a museum, so why not just hit the highlights? Food tour guides are city experts and will always include a cultural component to their tours. This means that between food stops, they will point out where Lope de Vega lived, maybe even show you where Picasso met one of his lovers (literally everywhere), and sometimes even lead you personally to the most renowned and important works of art. 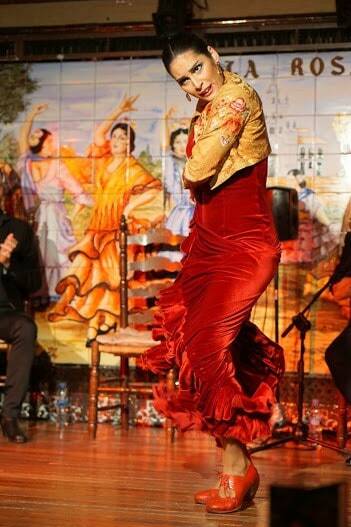 Seeing a flamenco show can be an entertaining and evocative experience. Seeing a bad flamenco show can be…disappointing. There are touristy imitations of flamenco throughout Madrid but nothing compares to seeing true flamenco artists— skilled guitarists, singers and dancers— interpret their stories of struggle with bravado and grace. The best, most impactful flamenco shows in Madrid fill up fast, and some seats are usually reserved exclusively for tours. Get a leg up on the throngs of Pride-goers who will also be hoping to witness the finest performance of this Spanish art form and book a food tour that includes prime seats to Madrid’s best flamenco show. Convinced a food tour in Madrid would make the perfect part of your WorldPride plan? Check out the offerings at Devour Madrid Food Tours, where the only challenge is deciding which delicious tour to take. If you’re visiting other cities in Spain, but sure to check out all of the food tours offered by Devour Food Tours (Madrid, Barcelona, Seville, Malaga, Granada, Galicia or San Sebastian). Note: this article was written by and in partnership with Devour Madrid Food Tours. As always, rest assured all opinions are 100% our own and we don’t sacrifice our integrity for a sponsorship. In fact, we went on their food tour several years ago and it was amazing. We would highly recommend it to anyone looking to get the insider tips on Madrid’s foodie scene. Featured image by Sasha Charoensub. Additional images provided by Devour Madrid Food Tours. Awesome article. Looks like you had lots of fun while writing this. Enjoyed too. Will try those dishes.